To think King Charles II used Guineas is amazing, but true. First struck in 1663, the Guinea was a mainstay of British coinage for centuries until its final striking and replacement by the Sovereign in 1817. 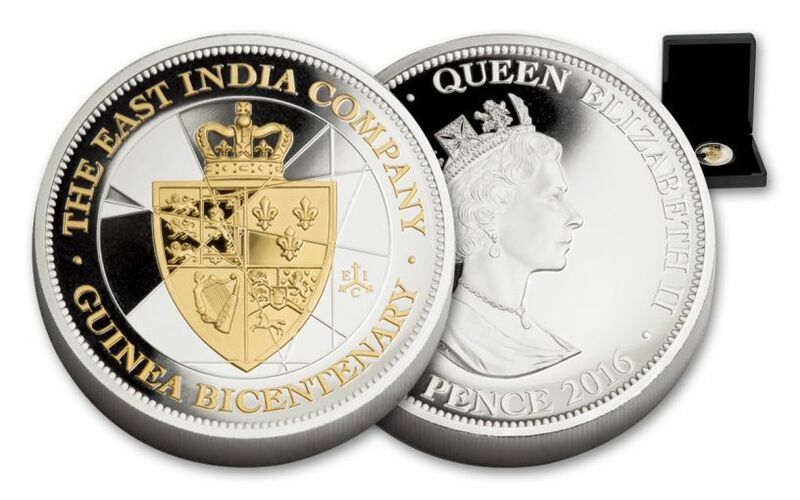 To commemorate the 200th anniversary of the last Guinea, St. Helena has released not just the one ounce, but this FIVE-ounce Silver Guinea Proof, struck in FIVE fabulous ounces of 99.9% fine silver with 24K gold layering! Where the heck is St. Helena? It's a small island in the South Atlantic Ocean. Discovered in 1502, it's one of Britain's oldest colonies and a historic trading post that used Guineas as tender. Now, you can have your own proof commending the end of the historic Guinea, but only if you act fast – because no more than 3,000 will ever be produced. Place you order now! HISTORIC SPADE GUINEA DESIGN -- Decorated with 24-karat gold gilding on the reverse design, this recognizable design represents a "spade guinea" introduced in 1787 under the rule of King George III. It features the arms of the United Kingdom (England and Scotland), France, Ireland and Hanover. A clean and simple yet impressive and historic design to add to your collection. 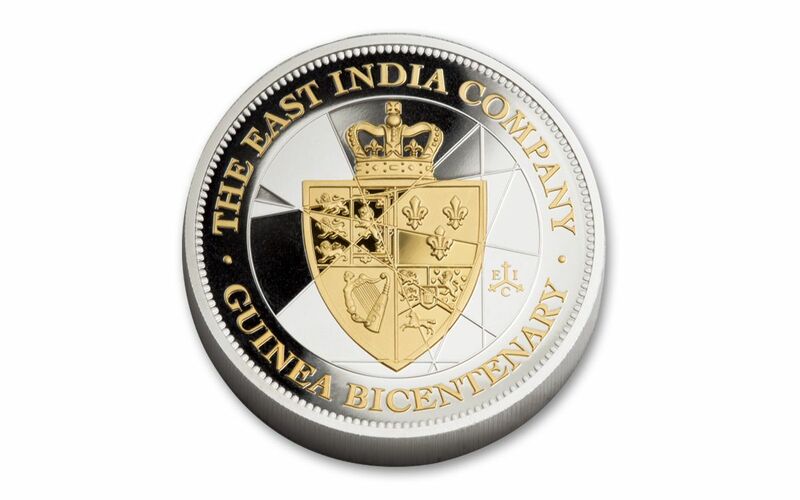 Five ounces of 99.9% fine silver is embellished on the reverse with inscriptions of THE EAST INDIA COMPANY at the top border and GUINEA BICENTENARY below. A special EIC mintmark is inscripted to the right of the spade. 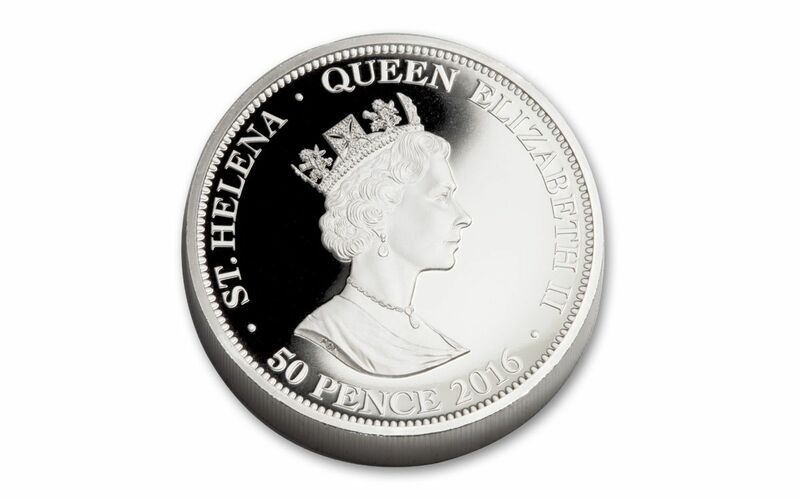 Queen Elizabeth II's new image graces the obverse, with inscriptions of ST. HELENA, QUEEN ELIZABETH II, and 50 PENCE 2016. GLEAMING PROOF OF PURE SILVER -- This proof is a full five ounces -- 155.5 grams -- of 99.9% pure silver that has been struck numerous times with polished dies. The result is amazing, sought-after razor sharp definition and high relief over mirror-like fields. In addition, it features elegant 24-karat gold layering of the spade shield, inscriptions and the EIC mintmark. A phenomenal proof for any collection! ST. HELENA LEGAL TENDER -- Each 2016 5-oz. silver proof is 50 pence legal tender, which is reflected on the note's obverse along with the Queen Elizabeth II. A pence is United Kingdom currency similar to the penny. PACKAGED AND CERTIFIED -- This St. Helena proof comes in an original mint box and includes a certificate of authenticity. 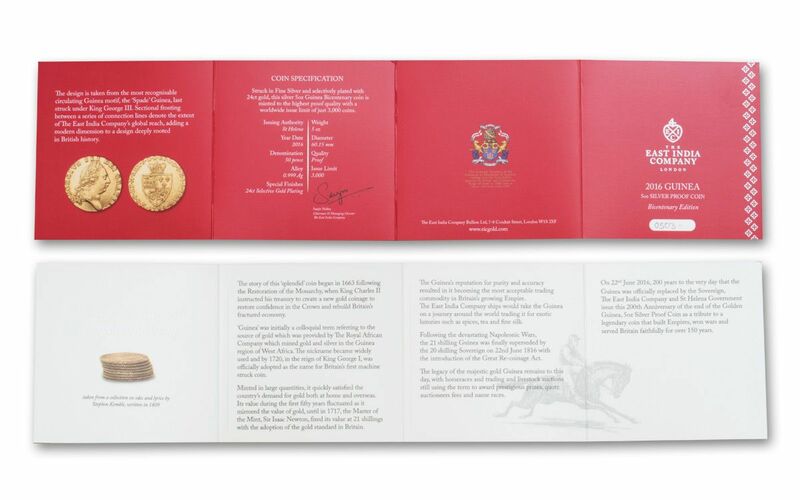 EXTREMELY LIMITED MINTAGE -- Only 3,000 of these proofs will ever be minted, so be sure to act quickly if you want this spectacular 50 pence proof to grace your treasured collection! Don't miss out on making this proof that honors the end of the Guinea yours! 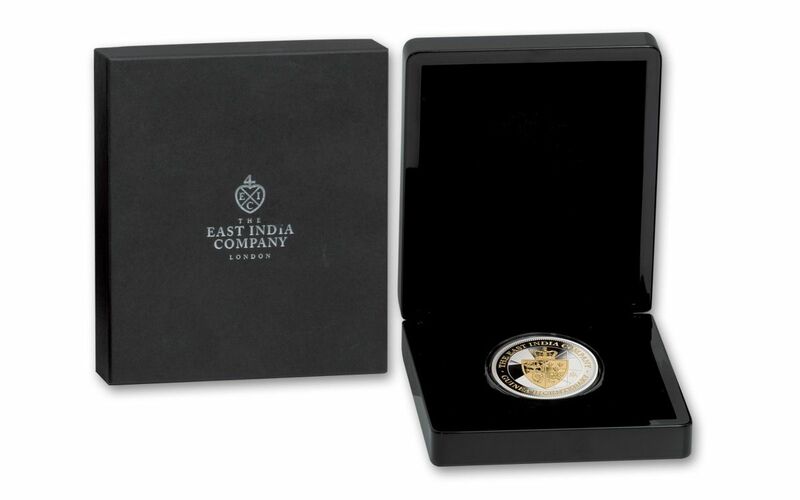 With such a limited mintage (only 3,000), you'll want to get yours as soon as possible. It won't be minted again, so place a GovMint.com order today!